Steaming your vegetables is one of the healthiest ways to eat them and vegetable and food steamers make steaming easy. Whether you are serving up large quantities of steamed veggies to your family or you are looking for a quick, easy side dish for just you or a few people, we’ve compiled a list of the best vegetable steamers out there. Before we get into the list, we’ll go over the different types of steamers so you can narrow down which one is right for you. How long should I steam the vegetables for? A traditional way of steaming food is doing so on a stovetop. If you have a saucepan and lid, purchasing a steamer basket is a simple way to steam food. 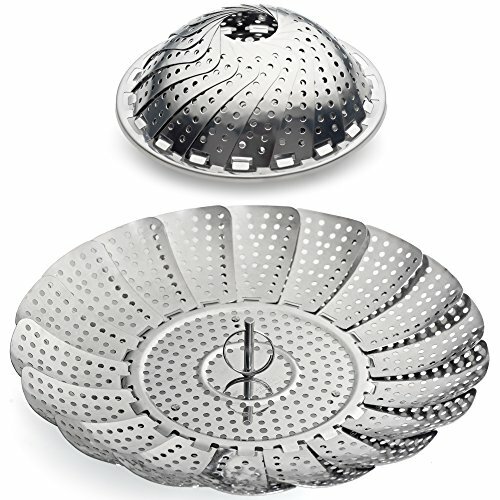 Steamer baskets can either be made of metal or silicone. 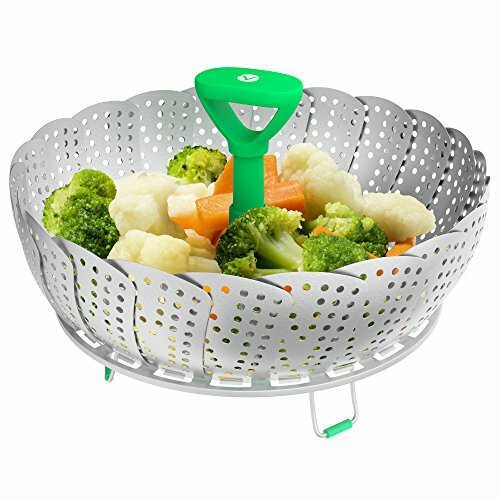 Metal steamer baskets are durable and are great for steaming heavier or larger vegetables. Silicone baskets won’t scratch pots and many can be used on both the stovetop and microwave. They will also easily conform to different sizes of pots. A bamboo steamer fits on top of a stockpot and is great for steaming a large amount of vegetables as well as other foods such as fish and dumplings. They come in various sizes and are multi-tiered. To prevent the bamboo from absorbing flavors while cooking foods, use a bamboo steamer liner. If you intend to steam a lot of vegetables or other foods (and have a little counter space to spare) then an electric food steamer might be right for you. Most food steamers stream much more than vegetables and can even cook rice and hard boil eggs! 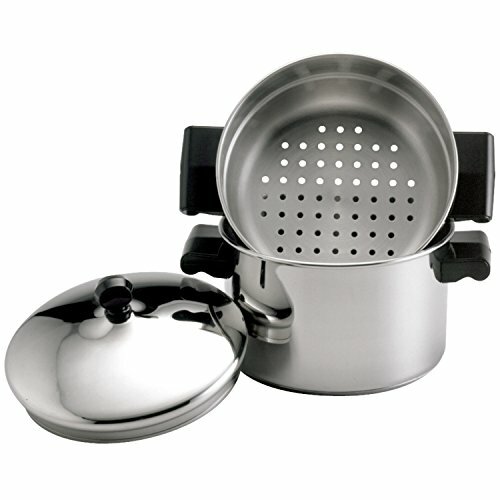 Food steamers can hold a lot of vegetables making it great for families and large gatherings. Most are programmable and have a “warm” feature to keep food hot for 60 to 90 minutes. Steaming vegetables is easy no matter which method you choose. Let’s go over how to steam vegetables with a steamer basket and bamboo steamer. Next, fill the pot with water. The water should reach the bottom of the steamer basket. Do not place steamer in saucepan yet though. Turn the burner on HIGH and bring water to a boil. Arrange veggies in the steamer basket and carefully place basket into pot. Put the lid on the pot. Reduce temperature to Medium-Low. Steam vegetables until tender but still crisp. Remove basket and serve vegetables with topping of choice (i.e., salt and pepper, butter, olive oil). *Tip: Check the water level while vegetables are cooking. You may need to add a little hot water to make sure the pan doesn’t dry out. First, fill a stockpot or pan with about an inch or two of water and bring the water to a simmer. Next, set the steamer on the pot. Cook until vegetables are tender or to your liking. Still a little uncertain about cooking with a bamboo steamer? Check out this video for some extra tips and how to use one correctly. For electric food steamers, be sure to follow the manufacturer’s instructions as appliances may vary. Whether you plan to cook vegetables frequently and in large amounts, or you want something for the occasional steamed veggie side dish, there is something for everyone on this list! The EasyVeggie steamer is made entirely out of silicone and fits a variety of pot and pan sizes. It is also microwave and dishwasher safe. This steamer comes with 2 oven mitts to make it easier to handle when using it in an Instant Pot or pressure cooker. The two handles of the basket join together to make it easy to lower and remove the steamer basket from a pot. The food grade FDA approved silicone is thick, heat resistant to 500 degrees and can hold up to heavy foods such as potatoes. It can also act as a strainer for foods. Easy to clean and easy to use. Both dishwasher and microwave safe. Thick silicone is durable and can hold heavy vegetables. Can be used as a strainer. Comes with silicone mitts for safe handling. Can be used in an Instant Pot or pressure cooker. The mitts are a little small and a little difficult to use. It’s hard to beat the original. This classic all-metal steamer will work for everyday steaming or the occasional side dish. 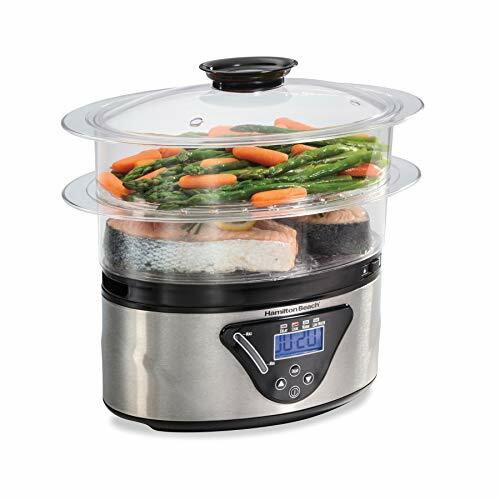 The durable stainless steel construction also means you’ll have this steamer for years to come. This simply designed high-quality vegetable steamer can expand up to 9.3 inches wide, allowing it to fit a variety of pan sizes. The center post can be removed for steaming bigger items or the included extension handle can be added for easier lifting. The only thing to keep in mind is that all metal equals all heat. Without any silicone, be sure to be careful when removing the hot steamer from a pan. Durable stainless steel will last for many years. Extension handle for easier handling. Center post removes to steam larger foods. All metal design means hot to handle. Be careful when removing from the pan! You can steam a whole meal in this electric steamer! 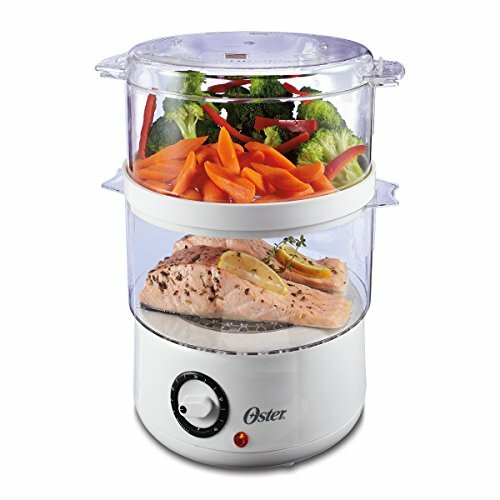 While this 5.5-quart food steamer can hold a lot of veggies it surprisingly doesn’t take up a lot of counter space. Choose either 1 or 2 tiers for cooking vegetables as well as meat or fish, or remove the divider to steam large vegetables such as corn on the cob. This steamer has a digital touchpad so you can set a timer or delay start your cooking. The steamer also automatically turns off and alerts you when the water level is low. It also comes with a rice bowl to cook rice with your veggies. While the drip tray and rice bowl are dishwasher safe, the food containers are not and must be hand washed. Cooks a variety of food including vegetables, meat, rice and more. Can separate food in two levels or remove the divider to cook large vegetables. The price is on the higher side compared to the other products on this list. Only some parts of steamer are dishwasher safe. This stainless steel 3-quart pot and steamer set is a no-fuss, easy to use way to steam vegetables. The saucepot heats up fast, meaning water comes to a boil quick so you can start steaming away! The handles are comfortable and allow the steamer insert to be removed safely. The whole set is dishwasher safe which means quick and easy cleanup. The pot can also be used without the steamer insert. Simple, easy to use set that comes with both the pot and steamer. Can use the pot with or without steamer basket. Only holds a certain amount of food in the steamer basket. Plastic handles can get hot and potentially melt. If you are looking for a classic metal vegetable steamer, this one will do the job. This expandable and collapsible steamer fits virtually any pot size. The heat-resistant silicone handle makes it easy and safe to place and take out the steamer from a hot pan. Be careful lifting this from a pan though! While the handle may not be hot, the boiling water and food are. Use a fork or other object if the pot or food is still hot. The “legs” of the steamer also have silicone grips so the basket doesn’t slip around. This steamer cannot be put in the dishwasher, microwave or oven. However, it is easy to hand wash. It is expandable and will fit into almost any pot and pan. Easy to use and can cook a variety of food. Quick lift silicone handle is heat resistant. 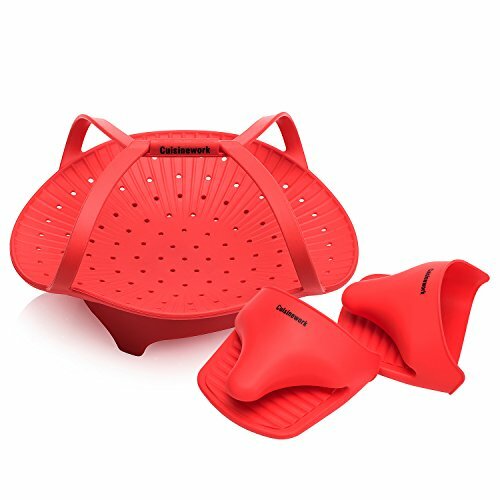 Silicone legs prevent steamer from slipping. Can only be used on the stovetop. Won’t fit really small pots. 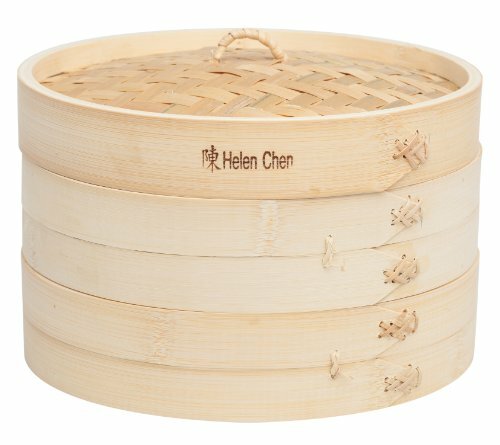 The Helen Chen’s Asian Kitchen bamboo steamer comes in 4 sizes (4”, 6”, 10” and 12”). 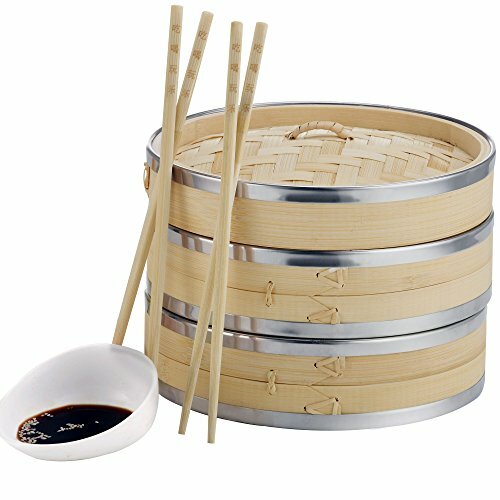 This steamer is made completely from tightly woven bamboo, and contains no metal or plastic at all. The lid of the bamboo steamer absorbs condensation so your food isn’t soggy and mushy. Not only can you cook vegetables, but you can also cook dumplings, meat, fish and more. The downside is since it is made of bamboo, it isn’t quite as durable as metal or silicone. It also takes up more space than a small metal steamer. Multi-tiers allow for cooking different foods for different amounts of time. It will break down over time and won’t last as long as a metal or silicone steamer. An electric vegetable steamer without the hefty price tag? Yes, please! Thanks to Oster, you can get just that. This 5-quart steamer can cook one or two levels of foods and is easy to use. Simply turn the timer on (up to 60 minutes) and sit back and wait for some delicious steamed veggies. When it’s done, it automatically shuts off. This steamer will also automatically shut off if it runs out of the water. It doesn’t have any additional fancy features such as a warming option or delayed start, so keep that in mind when cooking. Another bonus? Everything is top-rack dishwasher safe. The food containers nest in one another for more compact storing. Breaks down for compact storing. Cooks a variety of foods including vegetables, meat, and rice. No advanced options such as delayed start or warming feature. Looking for a quick and super easy way to steam some veggies on the go? Then consider the Sistema Microwave Steamer. The BPA- and phthalate-free container is easy to use and safe to handle. The locking tabs on the side do not get hot and make it easy to lift the container out of the microwave. The stem in the inside steamer basket also stays cool for safe removal. 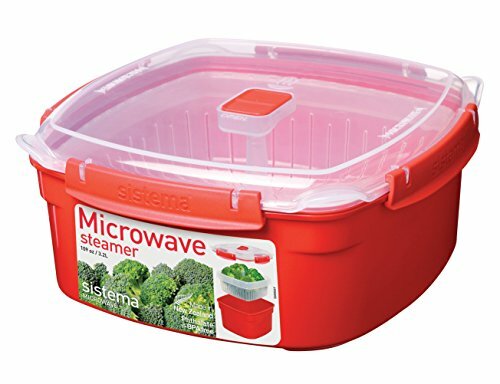 This microwave safe, dishwasher safe and stable steamer is great for use at home or at the office. Steam release vent on the lid prevents splatters which means a clean microwave! This container also works great for food storage and is freezer-safe. Great for use at work or home. Side tabs on the outside and center stem in basket stay cool. Besides the tabs and center stem, the rest of the plastic gets very hot, so handle with care. Doesn’t taste quite as good as food steamed via other methods. This 10-inch bamboo steamer has a very distinct look with the metal rim around the tiers, but the stainless steel banding is for more than just looks. It adds a level of stability and durability, keeping you steaming in the steamer for many years. The VonShef steamer cooks vegetables and other foods perfectly. Food won’t get soggy or lifeless. Vegetables will be crisp and retain their color, flavor and all those good nutrients. This affordable set comes with 50 wax paper liners as well as two pairs of chopsticks. Sturdy baskets are durable and long-lasting. Holds plenty of food for steaming. Even with the metal ring, will not last as long as non-bamboo steamers. Made of silicone coated stainless steel. Silicone or metal? Why not both? This silicone coated metal steamer gives you the best of both worlds. The silicone prevents any of your pots from getting scratched up and also makes it safer to handle. It is also expandable and fits different sized pots and pans. Need to fit in something bigger? The handle is removable. However, removing the handle does make it tricky to remove the steamer from the pan. The metal will hold up to heavy vegetables like potatoes, beets and more. And on top of everything, it’s also dishwasher safe. Metal makes it sturdy and stable. The handle is removable to steam larger foods. Without the handle, the steamer is harder to remove from pot. 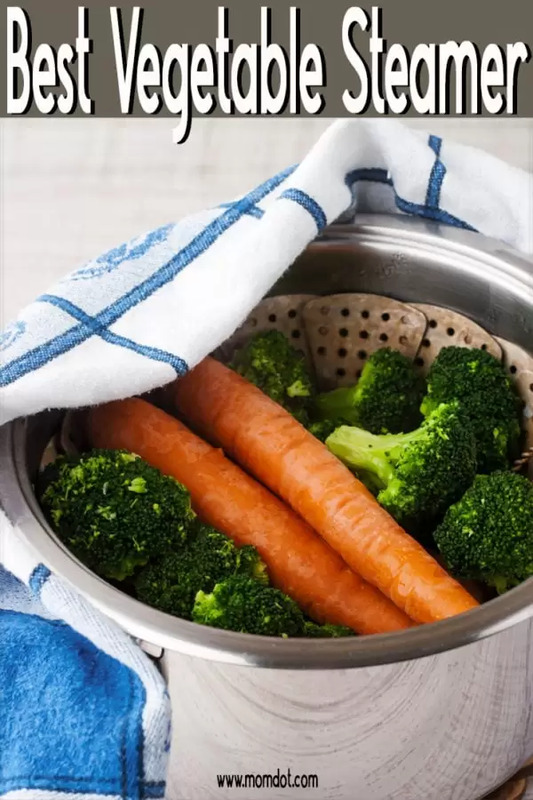 Q: Why should I use a vegetable steamer? A: One of the healthiest ways to eat vegetables is by steaming them. Steaming vegetables maintains the greatest amount of nutrients versus other cooking methods. Also steaming doesn’t require the use of any oils, butter or margarine which means no added calories to your dish. Steaming is an easy way to cook vegetables too. Microwavable vegetable steamers also make it easy to cook vegetables at home or at work. Q: How do I remove the calcium build up in my food steamer? A: For some, a layer of minerals such as calcium can develop on a steamer, especial electric food steamers. Keeping your food steamer clean will help prevent this from happening. But if it does happen, here is how you remove it. First, be sure you have unplugged your food steamer and that it is completely cool. Next, thoroughly wash all the parts with hot soap and water and dry them with a towel. If it is dishwasher safe, you may run it through the dishwasher. Just be sure that it is completely dry after being washed. Then, our 1 quart of vinegar to the fill mark of your steamer. Plug it back in and turn it on, allowing it to steam for 20 minutes. When it’s done, turn off the steamer and unplug it. Allow it to cool first, then pour out the vinegar. Scrub the inside of the steamer with a brush or sponge. Wipe the inside with a damp cloth to make sure all the vinegar is removed. 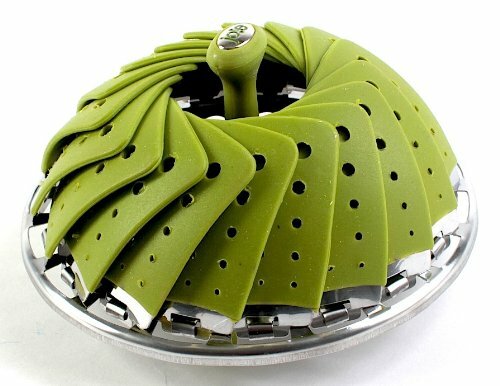 Choosing the best vegetable steamer is going to depend mainly on how much food you intend to steam and how often you are going to use it. For those looking to make big batches of delicious steamed vegetables or intend to use it every day, going with an electric steamer, such as the Hamilton Beach 5 Quart steamer, may make the most sense. However, if you are looking for a reliable steamer that will hold up to occasional use as well as frequent use, a classic steamer basket such as the CuisineWork EasyVeggie silicone steamer or the Sunsella metal steamer, would be a great choice.